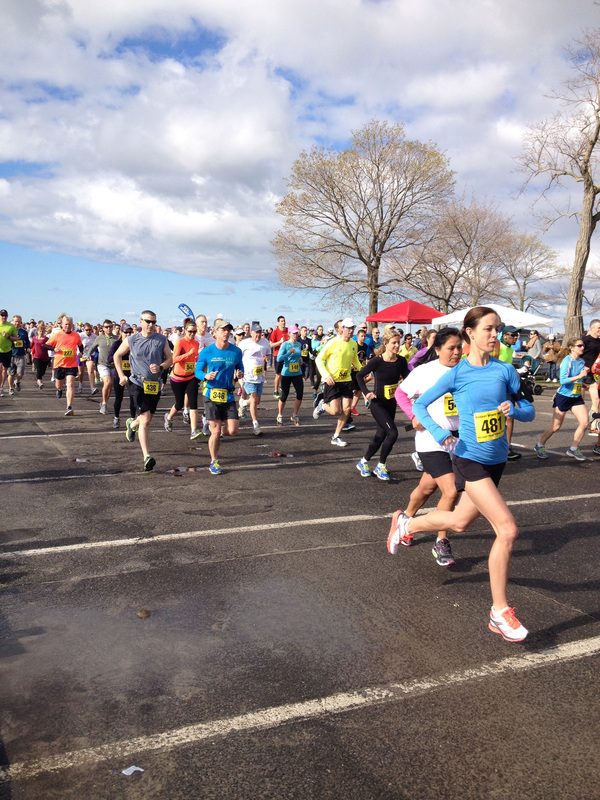 The start of the 2014 Westport Minute Man Race. and stronger bones. But for women, there are special concerns to be aware of in order to do the sport safely. For starters, the shape of our pelvis can affect the alignment of our hips and knees. A misalignment can potentially cause weaker leg muscles and repetitive stress injuries. Due to these muscle imbalances and misalignment, women runners are more likely to have hip and knee pain such as patella-femoral or iliotibial band syndrome (ITB). Studies also show that women are more prone than men to stress fractures. These maybe related to gender associated factors such as menstrual irregularities, especially with extreme training, lower bone mineral density, dietary deficiencies, narrower bone width, and differences in muscle physiology. The specific challenges we face as runners change throughout our life as our bodies change. For example, stress fractures are common in runners under age 30 while runners over age 40 are more likely to have Achilles tendon or calf injuries. Pregnancy brings added issues for women runners as they experience many physical, physiological and hormonal changes. During and after pregnancy, women face joint instability, looser ligaments, pelvic floor dysfunction, weight gain, weakened abdominal muscles or changes in posture. Overall, pregnancy changes a woman’s running biomechanics, which can lead to poor form when running. Despite all of this, it can still be beneficial to run while pregnant and after the baby comes, but it’s best to consult an obstetrician and physical therapist. At any age, women may experience leaking while running. This may be related to physical changes resulting from pregnancy, childbirth, menopause or aging. Do any of these problems sound familiar? The good news is that these issues can be alleviated. If you are having a specific problem, consider seeing a specialized women’s health physical therapist to perform a comprehensive evaluation on your functional mobility, movement patterns, and musculoskeletal system including the pelvic floor before your problem worsens or you have an injury. A physical therapist can help you prevent or recover from most running injuries and teach you how to safely train. At Ella Health in Westport, physical therapists consider the structural, biomechanical, hormonal, and functional considerations that are unique to the female runner and help develop an effective program to prevent injury and improve wellness. 1. Prather, H; Hunt, D. Issues Unique to the Female Runner. Phys Med Rehabil Clin N Am. 2005 August; 16(3): 691–709. 2. The Physical therapist’s Guide to Healthy Running. American Physical Therapy Association. 2011. e-book. http://www.moveforwardpt.com/running. 3. Hoch, A.Z. Pepper, M., & Akuthota, V. (2005). Stress Fractures and knee Injuries in Runners. Phys Med Rehabil Clin N Am, 16, 749-777. 4. National Kidney and Urological Diseases Information Clearinghouse (NKUDIC), National Institutes of Health. Urinary Incontinence in Women. Kidney.niddk.nih.gov/KUDiseases/pubs/uiwomen/index.aspx. Last updated 9/18/2013.